Last weekend I headed north to Manassas to check out a monthly IDPA match put on at the Fairfax Rod & Gun Club. Driving I-95 on the weekend anytime holds the possibility of sitting in non-moving traffic but I decided to risk it for another chance to shoot. Fortunately the morning drive to the range was without issue and I arrived after about an hour on the road. The club sets up six stages on three ranges. The ranges are spread out and require a few minutes walk (some folks drive it) between each. Most of the walks, and two of the three stages are pretty well shaded, which was welcome on the warm day. The first stage we shot started with the loaded gun on a table along with a beach ball. At the start the beach ball was knocked away (simulating hitting an attacker), then grabbing the gun there were three targets to be shot on the move. Moving next to behind low cover, we engaged five targets that were arranged in a rotated sequence. (Imagine a tumbling ninja.) Each target was to be shot in sequence with two hits required on each. The challenge here is that the -0 zone is not centered on an IDPA target so you had to pay attention to the orientation of the target. After we shot that scenario, we reloaded and move right over to a quick stage in the same bay. The lone target was engaged in a single six-shot string; two freestyle, two strong hand only, and two weak hand only. The scenario for the third stage simulated being surprised by bad guys as you left an elevator. At the start you moved behind cover to engage three targets from behind the "elevator" door opening. Then moving to the other end of a wall to find three more threats, as well as a couple non-threat targets. The next stage was an adaptation of the F.A.S.T. drill designed by Todd Louis Green. Starting with two rounds in the gun, the drill required two head shots, followed by a slide-lock reload, and four body shots. We ran the drill three times for 18 shots total. On the fifth stage we started by dragging a duffle bag backwards and engaging two targets on the move, strong hand only. After depositing the bag behind a barrier, there were four targets engaged from behind the cover. The final stage of the match was shot standing in one position at targets arranged from near to far. Starting one either side, the targets were engaged in a reverse "U" order; near, middle, far, middle near. Each target required three hits apiece. The trick here was to manage your speed as the target distance increased than shortened. This was a fun stage to shoot, though it may not be technically legal under IDPA rules. In a somewhat unusual requirement forced by the host property, we were required to case all ammo and guns when moving between shooting ranges. Even within the gun club property, neither open nor concealed carry is allowed. This is true even for unloaded guns during an event. It's unusual to have to stow gear between stages at an IDPA match, but at least we were frequently reminded to avoid any infractions. I find it ironic since the rule actually increases the amount of unsupervised gun handling required by participants, but it does protect club members from seeing people actually carrying guns. I was a little irritated by a number of questionable SO calls I heard, but being a first timer at the club I held my tongue. (The match director was very responsive to my feedback after the match.) Despite a few issues, I enjoyed myself and found it to be a fun match. The folks running the event are very enthusiastic and the other shooters all friendly. The stages were not overly complicated or difficult, which allowed all six stages to be shot and the props broken down fairly quickly at the end. Alas, the drive home was not as quick as the morning drive as I hit a few complete traffic flow stops on I-95. Still, it is another option for a place to shoot each month. In adding this event to my calendar I had a realization. 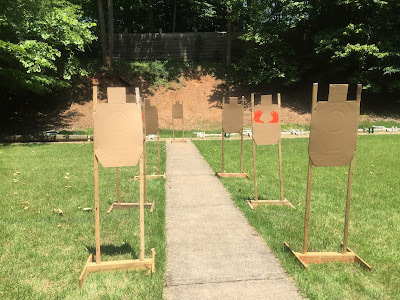 Although no events are actually in Fredericksburg, there are enough options within a one or two hour drive that it's possible to shoot an IDPA match just about any weekend, when I have the time and inclination to do so. And that's a good thing.